Thank you for visiting our feed department link here at Pro Ag Farmers Coop. We hope, through our website, we can keep you updated with what is happening within our system and what is new and exciting in the area of livestock feeds. Our staff is readily prepared to help you make important decisions regarding your feeding needs. Our current Feed Team includes: Tony Kokett, Brendan Meissner, Scott Bearson, Doug Bitzan, Dean Peterman, Scott Smedstad, Dave Henning and Kathy Boeddeker in Garfield. Representing our Clarissa location is Joe Wimmer, Lorne Perish, Steve Peterson, Darrick Becker, Tom Dirkes and Heather Lancaster. Our Pro Ag Feed teams have livestock nutritionists who work with our customers. They are Tom Giese, Matt Honsey, Jeff Thorpe, Ben Thorpe and Jim Lunemann. They have many years of experience and will be able to help customers immediately with ration and animal health issues. We have the ability to manufacture feeds customized to your operations. Whether you have dairy cows or you are feeding deer in your backyard, we have the feed ingredients necessary to produce high quality feed. 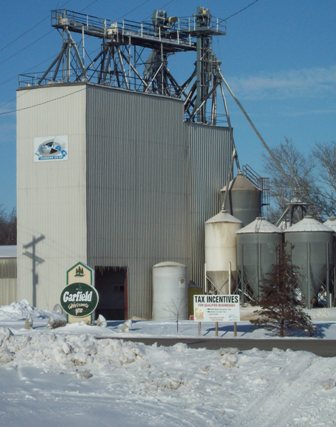 In our feed mill we have a wide range of ingredients available; for example, steam flaked beans, steam flaked corn, dried distillers grains, soybean meal, minerals and premixes, liquid feeds, and many other feedstuffs. It is in our interest to give you the best product available with the proper nutrient levels for your livestock. There are many benefits to working with us to help you run your operations. At times you may have questions that we are unable to answer about nutrition. That is not an obstacle to overcome for our department. We have access to professionals who have expertise in animal feed nutrition, and keep close contact to learn of new or changing feed information.